A Galileo thermometer consists of a set of floaters immersed in a clear liquid (typically ethanol) inside a sealed glass tube. Today a floater is typically a glass sphere containing a colored liquid and to which is attached a metallic temperature tag. The composition of a floater is irrelevant, its overall density just needs to be calibrated to a certain value and remain stable. Floaters being made of glass and metal, their volume – and therefore density – is largely unaffected by temperature. But when temperature rises, the ethanol around expands significantly. When its density matches the density of a particular floater, that floater will move at the middle of the tube, thereby indicating the current temperature. The remaining floaters will move at the bottom or at the top. Despite its name, the Galileo thermometer was not invented by Italian physicist Galileo (1564−1642), but by the Florentine scientific society Accademia del Cimento two decades after his death (left image). The Accademia del Cimento was founded in 1657 by Grand Duke Ferdinando II de' Medici (former student of Galileo) and his brother Prince Leopoldo, in order to attract scientists to Florence for mutual study. It was the first scientific organization founded for the sole purpose of making scientific experiments. Its motto was Probando e Reprobando, i.e., "testing and retesting". They created a number of scientific instruments before being demised in 1667. Galileo thermometers are now built and sold all over the world for decoration purposes (right image). Galileo did invent a thermoscope (a thermometer without a numeric scale) in the early 1600s, but it was very rudimentary, did not employ floaters, and was affected by atmospheric pressure. 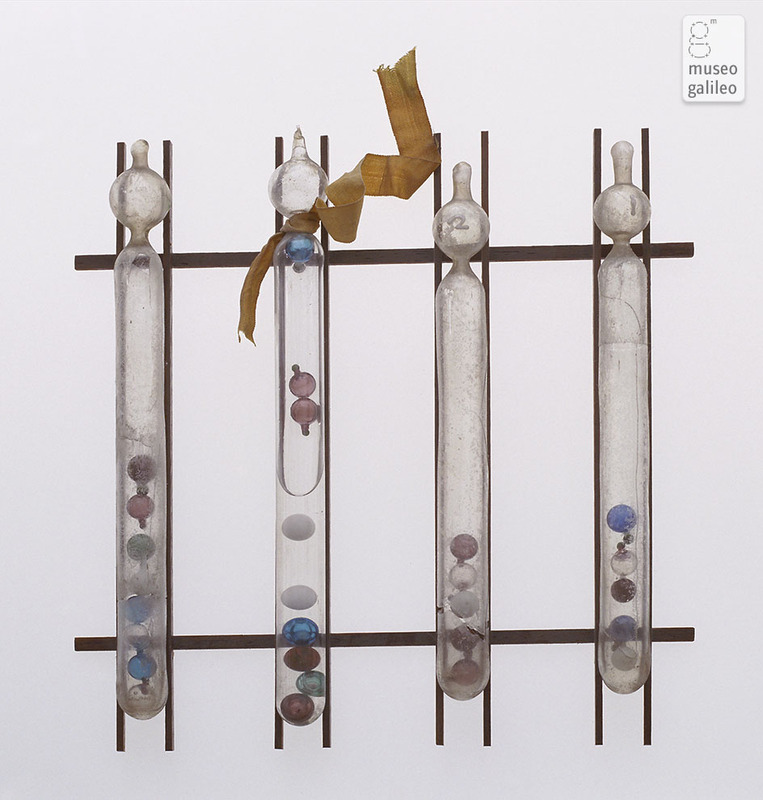 This instrument was an important invention but bore no resemblance to what is now called the Galileo thermometer. Nonetheless, it is clear that Galileo's inventions and writings greatly influenced the Academia del Cimento. Peter Loyson (2012) Galilean Thermometer Not So Galilean. Wikipedia article on the Galileo thermometer. Wikipedia article on Accademia del Cimento. Left image from the museo galileo website. Right image from Wikipedia.